Sennheiser Ambeo is 3D audio in 9.1 channels | What Hi-Fi? Sennheiser is betting big on immersive audio, launching a new Ambeo brand for its 9.1-channel audio capture and reproduction technology. 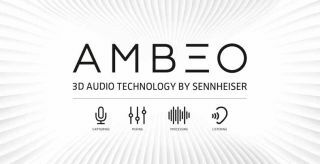 Sennheiser will be producing its own 9.1 audio products and will be involved in various '3D audio' activities, all of which will now bear the Ambeo name. Films, music, virtual reality products and room modelling are all potential uses for the Sennheiser Ambeo room technology, which Sennheiser claims will "revolutionise music, gaming and cinema". We first heard about Ambeo 3D technology at Sennheiser's 70th birthday party, but it was rather over-shadowed by the launch of the new Orpheus headphones. Sennheiser marked the occasion by recording a concert featuring Imogen Heap and the Junge Deutsche Philharmonie orchestra, using no less than 103 microphones. Sennheiser’s tonmeister Gregor Zielinsky has also made a number of 9.1 recordings for demonstration purposes, while the Ambeo tech can also be used to 'upmix' any music track into something approaching the 9.1-channel experience. Ambeo will be used in a new game called EDEN, which will use the Sennheiser algorithm to better place sounds and offer a more immersive experience for gamers, and there will be a Sennheiser VR microphone, designed with virtual reality production company, Visualise. Expect to see more VR companies using surround sound formats, such as Ambeo, as they develop. Alongside Dolby Atmos and DTS:X, it seems surround sound is set for a new lease of life in 2016. MORE: What are binaural headphones?